Winter months can be brutal not only on us but also on our dogs. Frostbite on dogs can happen quicker than you may have realized. Cold weather has the potential for your dog getting frostbite. I am going to discuss why frostbite happens, what temperatures cause frostbite, how to prevent frostbite and caring for a dog with frostbite. 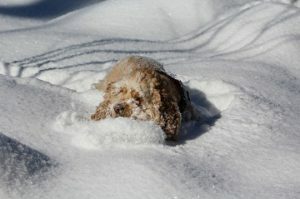 When it is really cold outside, it is very easy for our dogs to get frostbite, especially in their extremities. That would be the tips of their ears, tail, toes and nose. The body responds to the extreme cold by diverting blood from the extremities to the body to help keep the body warmer. Parts of the body away from the center of the body get less blood, which causes them to freeze more easily. This natural process protects your dog’s organs and saves their lives, but it also leaves the extremities more vulnerable to frostbite. 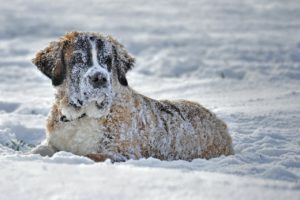 It is not only the temperature that needs to be taken into consideration, but also the wind chill when trying to prevent dogs from getting frostbite. Temperatures and wind chills that are above negative 17 degrees Fahrenheit should allow your dog to be safely outdoors for about 30 minutes. With temperatures below -32 degrees Fahrenheit, your dog should only be outside 10 minutes. Wind chills and temperatures that are between negative 18 degrees Fahrenheit and negative 32 degrees Fahrenheit only allow 10 minutes outdoors safely. Wind chills and temperatures that are between negative 33 degrees Fahrenheit or below, no more that 5 minute intervals for your dog to be outside. How long and thick your dog’s fur is, will help them stay warmer, but that doesn’t protect their noses or paws. Factors like the amount of body fat and the age of your dog could slightly change these recommendations, but for safety reasons, I would stick pretty close to these guidelines. Frostbite can be hard to recognize on your dog. The skin could be pale white, gray or blue color, but many times it will be beneath your dog’s fur, so it is hard to see. Dogs with frostbite dog paws will often limp. Frozen ear tips will often droop. The affected skin will be hard and nonpliable and will be extremely cold. Days afterward, there may be redness, blisters and possibly a serious infection. They could get to be a brittleness in the affected area when you touch it. 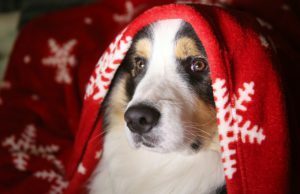 Your dog could show pain when you touch the body part that was frostbitten. You might notice swelling of the area and eventually the area could blacken or have dead skin. Any case of frostbite in your dog should be seen by a veterinarian immediately after you provide first aid at home. The amount of time that your dog is allowed to be outside in extreme conditions really needs to be limited and monitored for your dog’s safety. 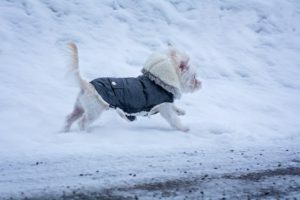 A jacket or sweater can help protect your dog from frostbite. Take your dog outside more frequently, but for shorter amounts of time. Put a jacket or sweater on your dog. This will help keep their body warmer, so all of the blood isn’t moving out of the extremities as quickly. Have your dog wear dog boots. Usually when it is cold enough for your dog to get frostbite, there is also snow on the ground. The snow forms balls of ice in between your dogs pads and it is like ice cubes around their pads. Snow boots for dogs can really help protect your dog from getting frostbite on their paws. It is up to us to make sure to keep our dogs safe in cold weather and to monitor how long our dog is outside. There are several things you should do right away if you suspect your dog has frostbite before even getting your dog checked out by your veterinarian. Check your dog’s temperature. 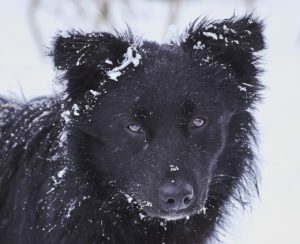 Many dogs who get frostbite, often will have hypothermia as well. Use a rectal thermometer that is lubricated with petroleum jelly. If the temperature is below 99 degrees Fahrenheit, begin treatment for hypothermia right away. Thaw the frostbitten areas. Try to thaw the affected areas by dunking them in lukewarm water for about 20 minutes. The skin will become softer, warmer and more pliable. If it is the ear tips, nose, or scrotum that has frostbite, wet a cloth in lukewarm water and hold against the affected skin for 20 minutes. Don’t rub the area, just hold against. Rewet the cloth several times to keep the temperature lukewarm. Get your dog warmed up after they were outside. After getting your dog’s skin thawed and warmed up, it is time to check in with your veterinarian to see if they think they need to see your dog for further evaluation. For mild frostbite, your veterinarian may recommend you apply an antibiotic ointment like Neosporin. Watch your dog for licking of affected areas. Dog’s will often lick sore skin, which will slow the healing process. Your dog may be required to wear the “cone of shame” also known as an Elizabethan collar to keep them from licking the affected skin. Your veterinarian will usually apply bandages to areas with serious frostbite. These bandages will need to remain dry. You can wrap the bandages with Saran Wrap when they go outside to keep dry, but remove plastic wrap when they are indoors to allow it to breathe. Severe cases might require prescription antibiotics as well. Frostbite on dogs is easy to happen on cold winter days and can happen quicker than you might even realize. Areas that you need to be concerned with is frostbite dog paws, ear tips, nose, tail and possibly the belly area that may be laying in the snow. Limiting the amount of time your dog is outside is the best prevention for frostbite. You can also help your dog from getting frostbite by having them wear a jacket or sweater, and boots for your dog’s paws are very helpful preventing frostbite. Always look your dog over when you get in from extreme outdoor temperatures to make sure they are doing OK and remove any ice chunks from between their toes. If you would like more information with regard to dogs with frostbite, wikiHow provides some great pictures for treating frostbite on dogs.